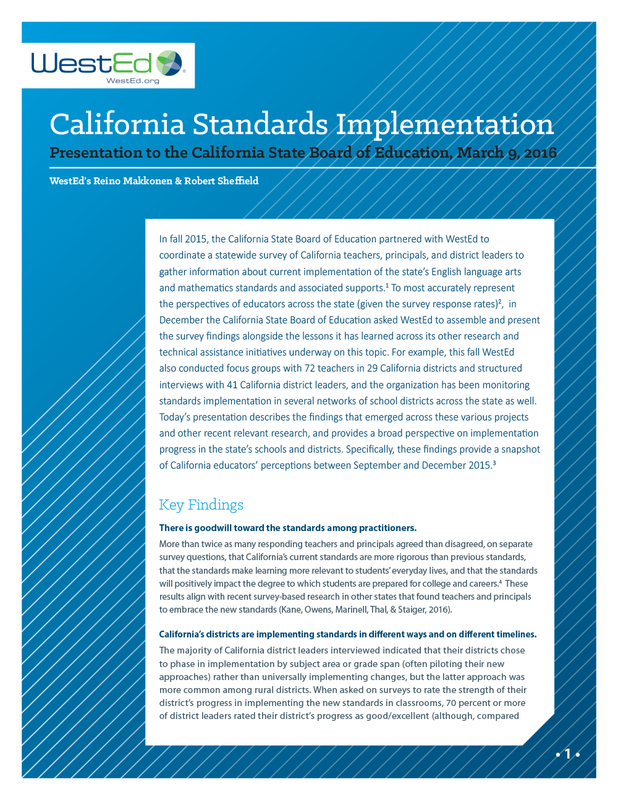 Educators across California are implementing the new state standards. How are things progressing? The California State Board of Education partnered with WestEd to coordinate a statewide survey of California teachers, principals, and district leaders to find out. Educators surveyed between September and December 2015 provided their perspectives on current implementation of the state’s English language arts and mathematics standards. WestEd assembled and presented the survey findings alongside the lessons the agency has learned across its other research and technical assistance initiatives underway on standards implementation. This report describes the findings that emerged across these various initiatives and other recent relevant research, and provides a broad perspective on implementation progress in the state’s schools and districts. Learn about the leadership role teachers can and should play in implementing the English language arts/English language development (ELA/ELD) Framework. Review sample English language arts performance tasks and scoring rubrics, and explore ways to design classroom instruction and assessment that support and challenge students. Learn instructional approaches that support the goals of the new standards.